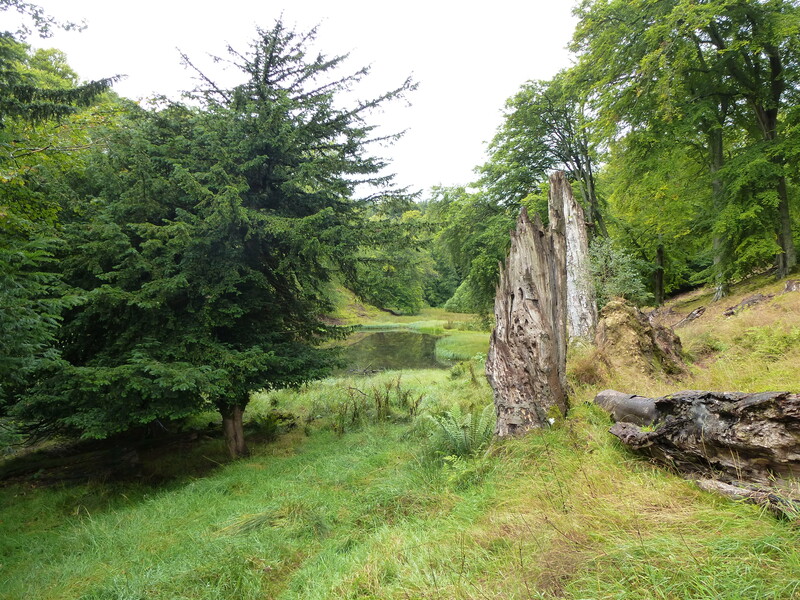 It’s been well over a year since I made my first trip to the Lost Gardens of Penicuik, but I have thought a lot about this wild and wonderful place since that visit. Last week I was able to visit again, and explore more of its magical corners. First on my list of things to see was Knightslaw Tower. Although it may look medieval, the tower was actually built in the middle of the eighteenth century by Sir John Clerk of Penicuik, an enthusiastic antiquarian with a taste for the ancient. 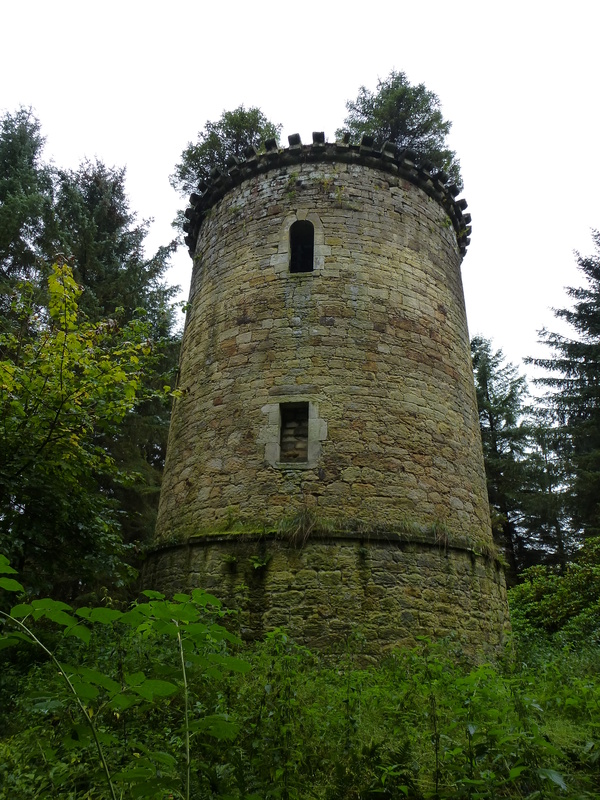 When first constructed the tower could be seen from miles around, and dominated the rest of the Penicuik estate. Since its heyday, however, the tower has fallen into disrepair, and the high trees which have grown up around it hide it from the outside world. The result is a rather melancholy, but definitely quite magical ruin. Next I walked on past the majestic ruins of the huge mansion of Penicuik House, built by Sir John’s son James in the 1760s, and into the valley below. Here I found the river Esk, which babbles its way down from here to nearby Roslin Glen, another of my favourite spots. Once over the river I crossed a field, heading uphill until I reached the Hurley Ponds. 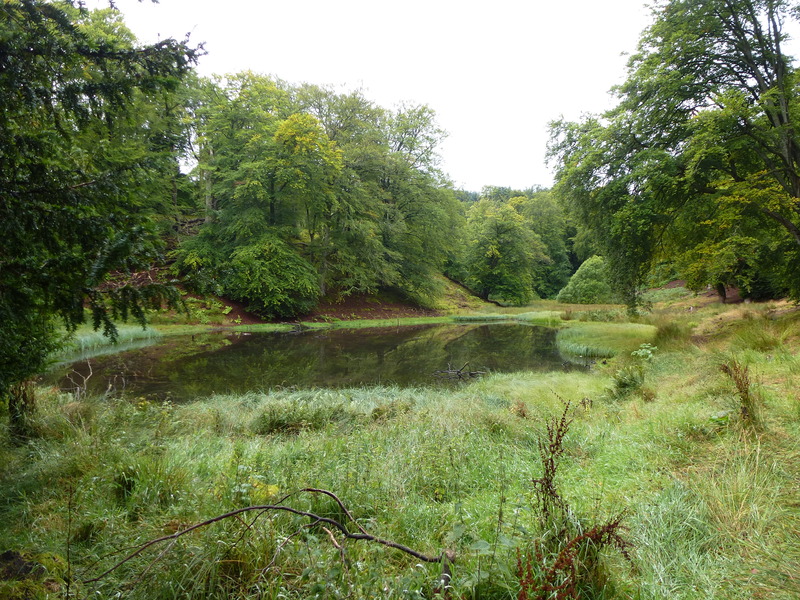 The Hurley Ponds are another of Sir John Clerk’s creations, part of his ambitious plans to landscape his park at Penicuik. Once used as fishing ponds, they have now largely returned to nature, spookily quiet apart from the odd quack from the resident flock of ducks. 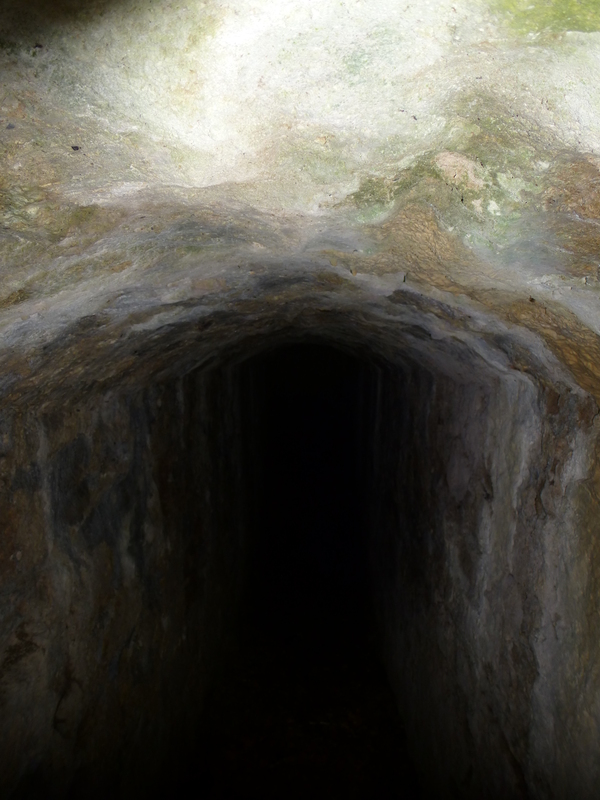 Sir John was obviously rather partial to a magical experience himself, and evidence of this can be found in his construction of the Hurley Cave, a rock-cut underground passage which leads from the side of the hills closest to the house into this secluded valley. The original entrance to the cave was over a bridge across the Esk, where a cascade waterfall was constructed to add to the sense of drama. Visitors would presumably have been guided through the cave with candles or burning torches, and half way down would have found a carved Latin inscription Tenebrosa occultaque cave, beware dark and hidden things. The other end of the cave emerges from a rusticated stone doorway in the hill, and can still be seen today. Unfortunately vandalism and structural problems mean that the Hurley Cave has had to be locked up. Its heavy metal door does, however, have a large gap at the top which allows a glimpse of the dark depths beyond. I couldn’t resist sticking my camera into the gap and taking a picture. It offers an enticing hint of what lies beneath. Much work has been done to consolidate and preserve Penicuik House and its estate in recent years, largely thanks to the hard work of the Penicuik House Preservation Trust. Apparently both the cave and the tower are on their list of works for the future, but restoring both will be an expensive job, and fundraising is ongoing. In the meantime I was happy to enjoy the overgrown, rather sombre mood of the lost gardens, and imagine the dingy depth of the Hurley Cave. I like to think Sir John would have approved! For details on how you can support the sterling work of the Penicuik House Preservation Trust, click here. This entry was posted on September 27, 2015 at 2:40 pm and is filed under Castle, Caves, Gardens, House, Ruins, Scotland with tags Cave, Ducks, Garden, Lake, Penicuik, Pond, Ruin, Scotland, Tower. You can follow any responses to this entry through the RSS 2.0 feed. You can leave a response, or trackback from your own site. Deliciously neglected and overgrown! 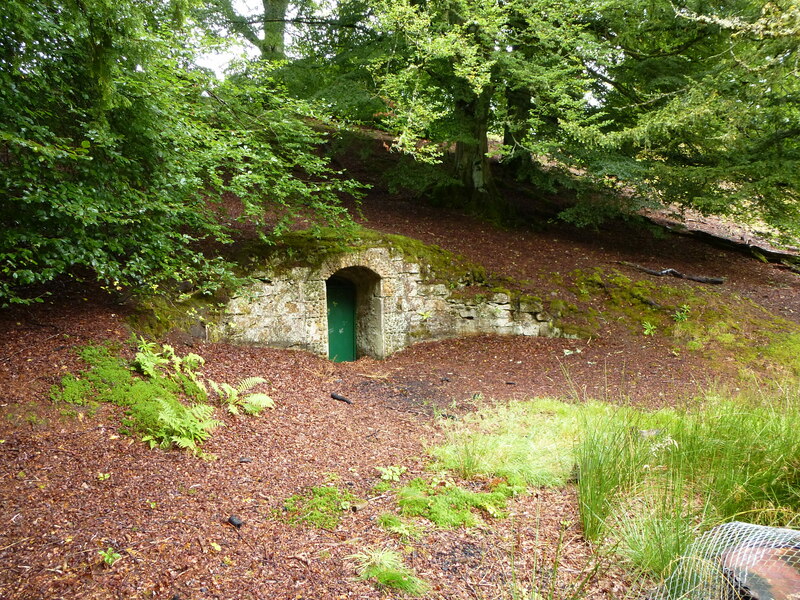 I didn’t know anything about Penicuik House or the cave. Fascinating, as always! It’s well worth a visit if you are ever in the area – a spectacular location with a fascinating history.